Many cities, not only in Japan but worldwide, have developed around train stations. Yet even though the whole city shares the station, there is often a disconnect between the two sides of the track. It is almost as though there are two cities joined at the station. In Shibuyaﾕs case, the two sides are Shibuya East and Shibuya West. While the divide is not as radical as the historical global divide between the Orient and the Occident, the two sides of Shibuya station have very different personalities, and it is instructive to explore how the two cultures developed. 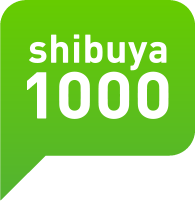 This is the focus of this yearﾕs Shibuya1000 symposium. The symposium will be followed by a social and networking opportunity nearby. For the past five years, Shibuya1000 has organized Shibuya-themed urban expositions showing how the city has developed and how the people interact with both the city and each other. 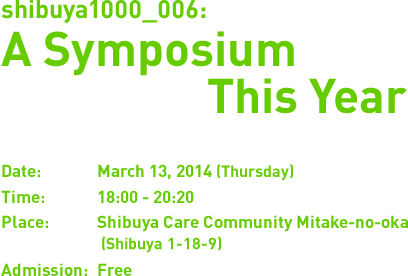 This year, the many faces of Shibuya will be presented in a symposium featuring some of the leading observers and thinkers.